LG is still very quiet about Android 4.0 Ice Cream Sandwich software on their Android phones. But we just heard something from Mr. Leak. We just got wind of some photos of an upcoming LG smartphone, which is yet to be announced. The device will reportedly be called LG Optimus U1 and will be the company’s first handset to run on Android Ice Cream Sandwich. We are expected to see it somewhere in early 2012. No other details is not found at this point. 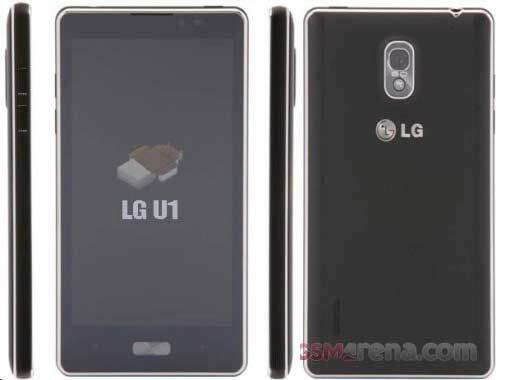 But GSMArena suggests LG U1 looks like a Korea-bound smartphone, judging by its design and it would make perfect sense for LG to release a handset called Optimus U1 there. LG-owned telecom in Korea was recently renamed to U+ and U1 seems like a proper name for a smartphone that will be launched on it.